The German Beer Purity Law has 500 years of tradition. If you’ve ever had the dubious pleasure of tilting back a can of Holsten Premium, you’ve probably noticed the proudly displayed banner at the can’s bottom that reads “GERMAN PURITY LAW OF 1516.” This purity law doesn’t refer to, uh, other infamous German purity laws, but specifically to the 500 year old law called the Reinheitsgebot, which governs what can legally be referred to as “beer” in Germany. Saturday April 23rd marks the 500th anniversary of this law which originally stated beer must only contain barley, hops, and water (and was later amended to include yeast.) It was put in place for a number of reasons, including limiting competition for grains with bakers, and to ensure beer was brewed without odd – and possibly illness inducing – ingredients. It started as a sound economic and food-safety initiative. But that was a half-millennium ago – and it has since outworn its value. “I think it is antiquated and a bit too rigid in its design. I think that we have grown past what the Purity Law was about,” says Matt Sieradzki, Prud’homme Master beer sommelier and Bar Manager at The Craft Brasserie in an email. Sieradzki has a point – what worked 500 years ago doesn’t necessarily work now. With the explosion in craft beer, and the wide range of ingredients being used besides — and in addition to — hops, barley and water, the German Beer Purity Law is only holding back German beer. That’s not to say there’s anything wrong with a traditional pilsner. Far from it – but limiting brewers to an extremely rigid lineup of styles is only going to undermine their creativity. I also enjoy a good German beer. I whet my teeth on Paulaner, a beer I continue to love. But one thing every beer drinker has to admit – from a diversity standpoint German beer is a disappointment. Right now, there is a serious push to bring Germany into the craft beer movement. With Stone Brewery opening a location in Berlin, and other breweries like Klosterbrauerei Neuzelle still battling after 600 years of operation to have their brew called “beer,” it seems like change is in the air. 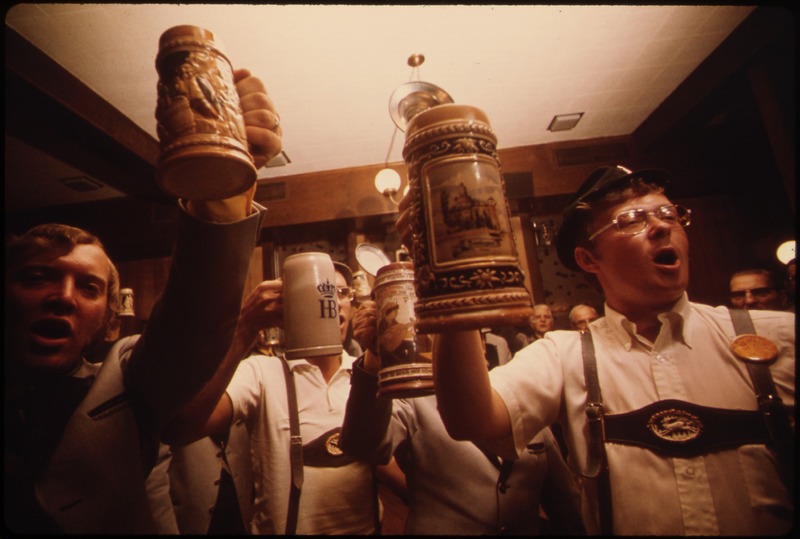 The 500th anniversary of the German Beer Purity Law is this Saturday. It’s time to let this old tradition die, and usher in a new era for German brewers, and beer drinkers alike. I for one would love to see German styles of Gruit, or chocolate stout, or any other number of beers (including Monastery brews like those in Belgium) be considered beer, and pave a whole new era of German beer. Go to Germany. Drink in Berlin, or any other large city and you will find so, so many different and new beers. Respecting the old while ushering in the new is what the younger brewers in Germany are all about. Trust me, they won’t let the craft beer revolution pass them by. I can imagine! Now imagine those same brewers weren’t confined by outmoded tradition? One based in economic, health and religious policies that were relevant 500 years ago? The diversity and range of German beers would only increase. The ducal decree of April 23rd 1516 had little relation to purity of quality but served in particular the regulation of the beer price, securing the revenue on barley and the establishment of a lucrative wheat beer monopoly. The Bavarian state ordinance has been altered as early as 1551 with the inclusion of laurel and coriander while 1616 saw the addition of juniper and caraway. The term “Reinheitsgebot” was documented for the first time in 1918 and served the sole purpose of protecting German Beer from the increasing imports. Today the “provisional Beer Law of 1993” governs what can be brewed and sold as “Beer” in Germany. It allows: Reverse-Osmosis for water treatment, High Gravity Brewing (the brewing of stronger batches and dilution to one or more varieties prior to bottling), the use of hop extracts, the use of roasted malt extracts (e.g. in order to package a batch of light lager as a dark lager), the use of artificial filtration aids such as Polyvinylpolypyrrolidone (E1202 – to stabilize the beer in a way that there will be no protein haze for years to come). The legal base for the provisional beer law is anything but solid. The European Court of Justice ruled as early as 1987 that in the course of free movement of goods, foreign beers not complying with the provisional beer law can be marketed as beer in Germany. Eight years later, the Federal Administrative Court of Germany ruled: “Whether the Reinheitsgebot can be justified constitutionally is controversial. It is an occupational rule thus restricting the fundamental right of the brewer protected in Article 12, Section 1 of the Constitution.” And on: “the maintenance of a cultural tradition and securing of a certain product level does not require to ban all deviations from the purity law as if they were automatically inferior, deceptive (adulterated) or even dangerous beer”. The provisional beer law includes paragraph 9, section 7, which facilitates that upon request a deviation from the limitations of the provisional beer law can be permitted for the production of “special beers”. However this revocable and dutiable certificate of exemption is a matter of interpretation of the individual state and not an option at all in Bavaria. Due to this legal situation the provisional beer law would not stand a lawsuit by a German brewer at the European Court of Justice. The result would be that in the future all beers would have to adhere to the European Food Directive, which would allow the use of artificial enzymes, colorants and flavorings. The latter has to be prevented with a vengeance. We accept that the term ”Reinheitsgebot“ is a strong brand. The provisional beer law has to take the next evolution stage (as it did numerous times in the past) and turn into a “Natürlichkeitsgebot” in order to preserve this brand for the future. It is a complete mystery for us why we should brew bottom fermented beers only with barley malt – why can’t we brew a bottom fermented rye beer? Why is it ok to mix a Berliner Weiss with a syrup made from artificial coloring and flavoring but not to age it on Raspberries? Why can’t we just brew traditional German beer styles such as Gose (with coriander and salt) or historic international beer styles such as dry Stout (with unmalted barley), sweet stout (with lactose), Wit (with coriander and orange peel) or Kriek (aged on Cherries) and market those as beer? We German Creative Brewers call upon the German Brewers Associations to work together in order to immediately work out a legally binding, nationwide solution that enables all brewers to use all natural raw materials suitable for human consumption for the production and marketing of beer in Germany, while banning all artificial additives and extracts. Then we would have a good reason to celebrate together! Yes, the purity law is outdated. End of that particular discussion. But make no mistake: the diversity of traditional German beers is huge, a fact that’s being constantly neglected by the “craft beer” advocates. German beer styles are rooted in a great amount of regional traditions and variety (and, yes: there are old fashioned craft brewers everywhere), whereas the modern craft brewers have similar backgrounds and tend to share attitudes. Can we have both? Yes, please. Is “craft brewing” really under threat? Don’t think so. Actually, to tell the truth, there is nothing wrong with the Reinheitsgebot, and I’m surprised about the apparent negativity of the article. You need a point of reference somewhere, and this is it. While the ‘craft beer’ revolution gathers pace in other places, my question would be why do we need it? Many of the beers are rancid and should never have seen light of day, let alone be called beer, so it’s good to have the reinheitsgebot to keep a lid on things. Anyone that thinks there is no diversity in German beer has simply never been there. Smoth thinks that the brewers are ‘confined’, but if you ask the brewers, they don’t see it that way at all, they are proud about their adherence to the tradition and proud about their maintenance of product quality. Unfortunately, in the English-speaking world, it doesn’t work like that. I am a proud home brewer, and take pride in my German Pils, but a couple of months ago I used Chinook hops, rather than Tettnang, and while the beer was/is excellent, it’s not Pils, the flavour profile is completely different. It is the reinheitsgebot that gives me this point of reference, we should thank them for it.